In a microwave, prepare Valley Fresh Steamers according to package directions. Once the Steamers are finished cooking, microwave the sausage for 60 seconds. 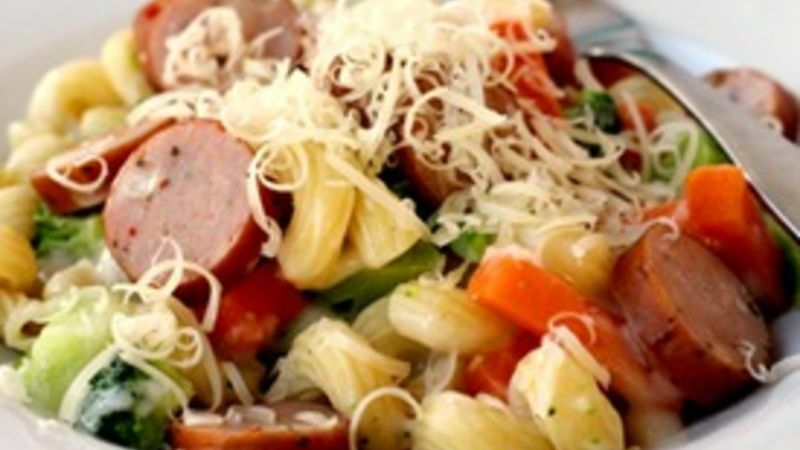 Toss the pasta and sausage together. Serve sprinkled with parmesan cheese. Think you're too busy to make a delish 'n nutrish meal for yourself when life has you on the go? Think again! You're life is busy city. After all, you're making something of yourself. In and out of the office. Working hard for that next promotion Running errands. Keeping track of friends and family. Saving the world. This is some seriously legit stuff you're doing with your time. Who has time to eat? Yep, there are fantastic convenience foods that make healthy eating for fabsie gals like you totally realistic, doable, and delicious. See that pasta dish up above? All you need is a bag of Valley Fresh Steamers and some precooked chicken sausage. Yeah. CHICKEN sausage. You are, after all, attempting to survive life without Spanx, right-o? And while you're at the grocery store grabbing those delicious Steamers, pick up a box of Whole Grain Chicken Helper. Then turn it into this crazy delicious curried Captains Chicken Haystacks dinner. It's so gosh-darned good, you'll want to swim in it twice. Yep. Double dipping. It's like that around here. Valley Fresh Steamers Roasted Red Potatoes blend tastes amazing when it's turned into a simple hash. Think breakfast for dinner. Times awesome. It's good math. Try tossing the bag of sauce-covered potatoes and green beans with bacon bits, and top it off with a fried egg. It's like, totally OME. Oh.my.egg. ...and you can make single-serving sized versions of a warm and wonderful pot pie with just Bisquick and Progresso soup. Pretty and delicious. Just like you! To top off your yummy day of eating, make sure you grab one of our favorite, healthy on-the-go snacks. Chocolate-drizzled Fiber One bars and Yoplait yogurt add a bit of sweetness to your menu without adding a lot of calories. Smart, savvy, and skinny? Oh yeah, baby. You know how to work your groove thang. And there you have it, Gal on the Go -- lots of crazy easy ideas for you to make on the fly and still fly out the door without missing a beat! What's your favorite go-to nutrish and delish recipe when you're on the fly?